On Thursday 9th June Holsworthy Community College welcomed Rob Heard, the Shrouds of the Somme 19240 Project artist. Rob came in to talk about the artistic installation that will be on show at Northernhay Gardens, Exeter from 7am on Friday 1st July to 9pm Thursday 7th July. Rob has been working on this project for over 3 years, with the last 14 months solidly working 14 hour days to create the individually hand-stitched shrouded figures. Once the figure is enshrined in the shroud it becomes more than a figure in cloth, it is representative of one of the 19,240 soldiers who died on the first day of July 1916, the first day of the Battle of the Somme. Each figurine feels different to Rob. Each one will be laid out, with space between them, to commemorate these brave soldiers who died in one of the worst battles in military history. The display will also include the names of each of the soldiers that died, displayed on 14 large boards – each individual name to be associated with a figurine, each soldier with family and friends that loved them, never to return to them, some bodies never found. Rob is hoping that this display will in some way bring home those whose bones remain in the battlefields. It is important we remember the enormity of this number of casualties – a number is a number – a physical representation is something different. 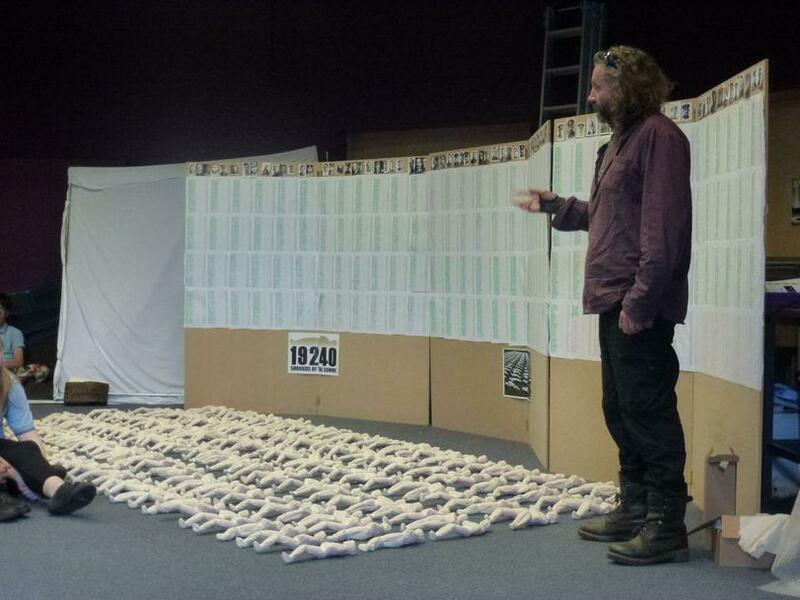 Rob brought with him 192 shrouds, representing 1% of the total number that will be laid in Exeter. He also invited HCC students Kayleigh, Louise and Sophie Daniel, George Daniel, Mr Timothy Daniel, Mrs Judi Daniel, and Mrs Bridget Barkwill who are relatives of John Charles Milford, who died on the first day of the Battle to his studio to make his figurine and lay it at the installation. The Rifle Regiment of the British Army will also be involved in laying the 19240 figures. Max Snook- Bevis asked “How long does it take to make each figure?” to which Rob replied he can make around 200 each day – about 5 minutes each figure. David Kirby asked whether Rob had a relative who had died in this war – Rob had not had any relatives die at the Battle of the Somme. Rob felt compelled to do this project –“divine inspiration” was his driving force and he feels compelled to continue.